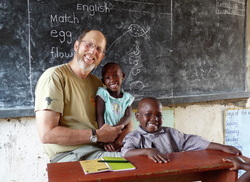 Help spread the word about the kids in Lukaya! Child of Lukaya music video--click here! Tree of Life Ministries is a registered Ugandan not-for-profit company limited by guarantee, organized to help alleviate poverty through education, conservation, healthcare and sustainable development. Our work is centered in Lukaya Town --a truck-stop along the "AIDS Highway." Currently our main projects are developing and operating The Mustard Seed Academy for children ages 3 to Secondary 2, TOLM Community Support Programme, and several initiatives in agriculture. Uganda is west of Kenya and east of DR Congo. The marker is approximately where Lukaya is located. Zoom in on Lukaya by clicking on the + symbol. Children are happy and healthy due to TOLM's network of caring. Effective, dedicated Ugandan leaders and caring Americans team up to serve "the least of these."